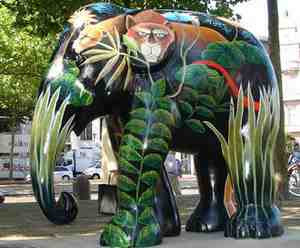 I am an artist decorating an elephant for the london parade in Bournemouth. The inspiration is the seaside and it's a community project and called 'KUBELLA'. Thanks for the link. I love the eyelashes! Please let me know how you get on. A graphic of the finished work would be appreciated. Please message me when you have one. Hi, We are also painting an elephant for the 2010 elephant parade. Its called 'Just Joey' after the rose. Check out our blog at www.artinbloom.co.uk/blog to see why!! Well done for covering this important charity. Hi. Thanks for the link. I'll check it out. When your jumbo is ready, please send a link to a photo of it for my blog. I am in the middle of mutating and mosaicing one of these elephants, with some fellow craftivists. Thanks for contacting me. You're the third ellie painter to have done so. I think I'm going to have an elephant-painting day on my blog to give you all a fair crack of the whip. Video too!